Cost of Sales declined by 3.2% from $12.29 billion to $11.90 billion. Consequently, Gross Profits improved 23.4% to close at $ 4.31 billion (2016: $3.49 billion). Gross profit for the quarter amounted to $1.36 billion compared to $1.11 billion booked for the fourth quarter of 2016. Finance and Other Income for the year totalled $846.95 million relative to $1.05 billion in 2016 a 19.6% decline year over year. Selling expenses increased by 11.6% to close the year at $658.34 million (2016: $589.83 million). Administrative Expenses for the year increased by 28.7% to total $3.04 billion (2016: $2.36 billion). As such, Operating Profit contracted by 8.5%, to total $1.45 billion (2016: $1.59 billion). Operating profit for the quarter increased 139.7% to close at $242.23 million relative to $101.05 million booked for the prior year’s corresponding quarter. Finance Costs totalled $377.13 million; an increase of 0.7% compared $374.63 million in 2016. Share of results of joint venture amounted to a loss of $72.13 million versus a loss of $28.16 million recorded in 2016. As such, Pre-tax Profits declined 15.3% to $1 billion in comparison to profits of $1.19 billion last year. Net Profit attributable to shareholders totalled $795.29 million relative to $1.09 billion reported in 2016, while for the quarter SEP booked $70.13 million (2016: $13.53 million). Earnings Per Share for the year ended December 31, 2017 amounted to $1.54 relative to $2.11 for the corresponding period in 2016. 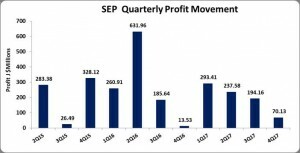 The EPS for the quarter totalled $0.14 compared to $0.03 booked in 2016. The closing price as at February 19, 2018 is $29.03. The number of shares used to calculate TTM is 516,397,918. As at December 31, 2017, the company’s total assets increased by 16% to $20.22 billion from $17.43 billion a year earlier. The major contributor was a 55% increase in Trade and Other Receivables while closed the year at $6.18 billion relative to $3.99 billion in 2016. Shareholder equity for the period was $9.35 billion relative to $9.19 billion last year. Book value per share is now $18.11 relative to $17.79 last year. The number of shares used in our calculations is 516,397,918.